Pressing onward with the drop pods, and they're coming along nicely so far! 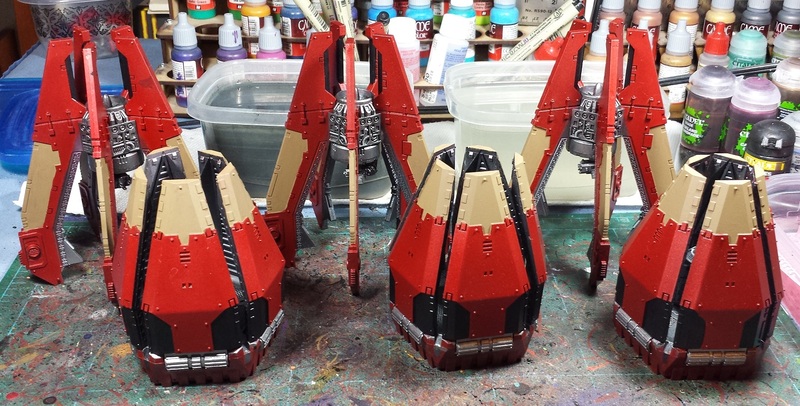 I had laid in some initial color patterns on the Storm Eagle earlier, and tried to fill in similar areas on the pods. Just blocking in the various areas, starting with a graveyard earth as a basecoat for the areas that will end up bone colored. I'm a little worried about the wash step that I use when it comes to the big flat areas like the fins, so extra care will need to be taken. On the up side, a multitude of sins can be fixed with judicious weathering, which the pods will be getting. 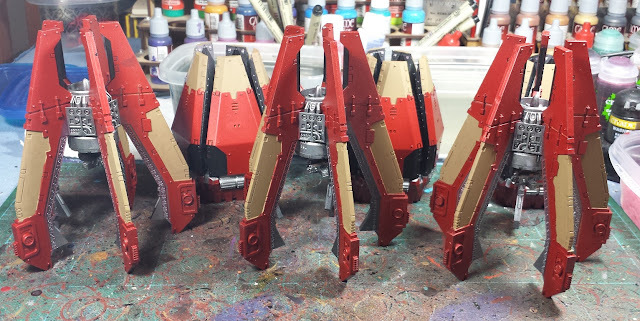 The black on the bottoms of the doors will get some gold or white hieroglyphics, while the white nova legion symbol will adorn one or more of the red doors (depending on how many I can scrape together in the appropriate size). Once the bone and black are done, they'll get some detailing picked out in gold, after which attention will be given to the interiors. So far so good! I will say that painting them has been more fun than building them was, but that's not saying too much. Looking Good. That's quite an army of Thousand Sons you have there. Coming along well chief. I am assuming the doors are all glued in place? 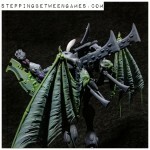 Looking great Mordian, Would never of thought to build them like that for painting...good idea. @Kevin Spyrle: Thanks man! There's a whole mess of 'em! @Rory Priest: Cheers! The door are all openable, but the primer and paint has given them enough friction to hold closed (long enough to photograph at least). @Jamie Farrar: Thanks! It's the first time I'd done so and it's certainly making it easier. @Todd Sherman: Hah! Yeah, the next several marine armies to cross the hobby desk will absolutely not be getting drop pods. Oof!